When I was fourteen I recall working a job with my grandfather on a newly built house. We were wiring the house for electricity since my grandfather is a plumber and electrician by trade. He yelled at me, “Do you have the wires screwed into the socket yet?” He told me which wire goes in what location but me being fourteen with quitting time on my mind I soon forgot which one went where. I ended up putting them where I thought he said to. At this point I was drenched in sweat from the relentless Texas heat and replied “Yeah I think so!” A moment later he flips the breaker and right in front of me there is a series of loud pops and flashes of light. “The damn thing is on fire, turn it off!” I rushed to get the fire extinguisher as we almost burned that part of the house down. He came in and told me that maybe I should focus and know when to speak up if I am not sure what I am doing. Electrical work is not for the amateur do it yourself person and I think the same can be said about investing in risky ventures. This experience was a crucial learning point that arrogance can be a means to a harsh learning point. Physicians after making it through the rigors of intern year, residency, and possibly even fellowship eventually become an expert in their field. While this is an exceptional achievement, the downfall is when this arrogance of being an expert extends into feeling like an expert in other fields. As discussed in my previous post, poor financial decisions by residents and doctors, many physicians think that this feeling of being an expert also will apply to being an expert investor with their money. One of the most well known examples, due to the high publicity in the 80’s, of a physician entering into bad investments was Dr. Cooley. An idol to many and by many accounts an excellent surgeon, person, and mentor. He was involved in a series of bad real estate deals that lead to a bankruptcy. despite him being the most famous surgeon at the time. An article from the LA times describes the situation well. Per the article, at the time in 1980 it was estimated that he was worth around $40 million dollars (~$120 Million in 2016 dollars adjusted for inflation). He at first entered many “safe” investment deals but over time became willing to take risks with each deal. Eventually the deals collapsed along with the oil market that the Houston economy was greatly tied to. This lead to him filing bankruptcy as most of his net worth was tired up in these investments. He had an estimated debt of $100 million dollars at the time. His reputation as a surgeon never faltered, however he ended up taking a huge financial hit that affects his legacy till this day. Real estate can be an excellent means to build wealth. Dr. Cooley was building wealth in the example above till he branched out and entered high risks properties in areas that he had not worked with before. Placing a large bet in an area with little knowledge can be a recipe for disaster. Also, accidents happen in life and real estate which means that the larger the property the more money spent on insurance which will eat away at your profits. Below is a picture of one of my neighbors who had a fire at a house that they were renting out. Turns out they were under insured and lost thousands of dollars on this accident. Soon after they decided to sell the property to recoup some of the money lost. 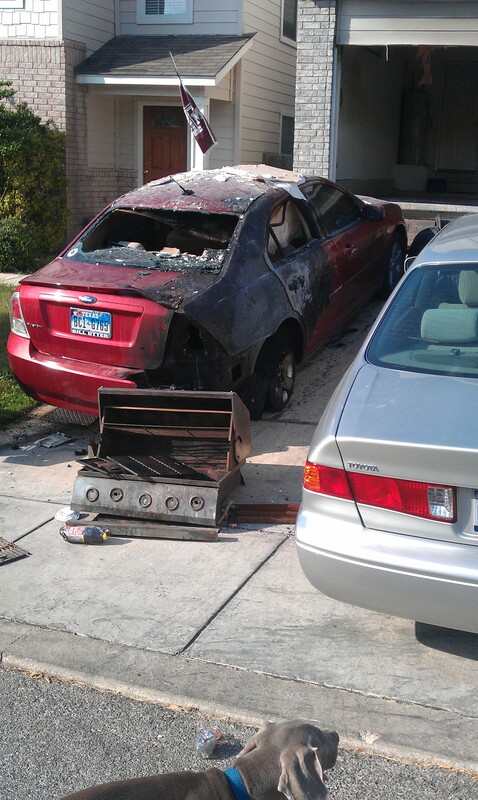 Neighbors car and garage caught fire after he decided to leave his grill unattended. Going to the blackjack table and winning the first time doesn’t necessarily mean that you are a skilled player. The same can be said for some methods of investing. For non diversified investments (such as individual stocks, real estate, commodities), each of these is a risk with odds of the bet paying off. In a hot real estate market it might be that everyone who bought a house 4 years ago made a lot of money without any skill or knowledge. Don’t be confused to think that just because you made a lot of money off of a single stock that you have become a Warren Buffett like investor overnight. It took years for you to become skilled at medicine and other fields can be very similar. Compounding interest is a way of life for many residents as student loans are paid back. Once those are paid off and that money goes into savings, the tide has changed for the interest to now be in your favor. You have worked hard to get to where you are at as an attending and its time you have your money work hard for you. Investing the money makes your money work just as hard as you do for financial returns. Finding a way to invest that makes you comfortable while yielding good returns is the name of the game that everyone is trying to balance. Find investments that you can sleep with even in a down market and minimize the downsize potential to each investment entered into. Stick to what you know. If you decide to invest in something as a part of your portfolio such as real estate rentals or a business then be sure you know what you are getting yourself into. Now is not the time to be learning from scratch. Learn with someone else money at risk and enter into deals with caution.